I was 9 when I painted a drawing of the church with my first poster colour set. 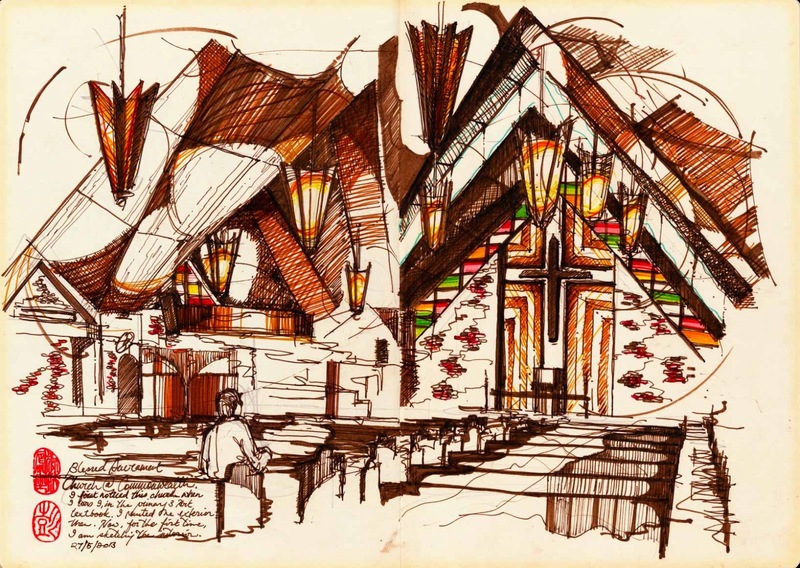 It was featured in the primary school art textbook and I was drawn to the beautiful roof structure which was supposed to be inspired by the tabernacle from the Old Testament (see story below). With a project to sketch the neighbourhood, I got a chance to go inside the church sanctuary and sketch inside the quiet place. It's like my relationship with the building has come a full circle. The Church of the Blessed Sacrament is a Catholic church located at Commonwealth Drive. Opened in 1965, it serves the Catholic community in the Queenstown area. The church building was awarded conservation status by the Urban Redevelopment Authority in 2005. In 1954, the Archbishop of the Malacca Diocese, Michael Olcomendy, who had been attending to the needs of Catholics in Singapore since 1937, became concerned about Catholics living in the Alexandra and Redhill areas, as there was no church nearby to serve them. At the time, the government was planning to develop the nation’s first satellite town, Queenstown, which included the Alexandra and Redhill areas. The government aimed to build a self-contained and balanced community within the Master Plan for Singapore. It was intended that the town would have all the necessary amenities such as schools, hospitals, markets, shops and places of worship. An advertisement was placed in the local press inviting religious organisations to apply for sites set aside in the plan, stating their programmes and intentions. Olcomendy saw the advertisement, submitted an application and was allotted one of the sites. As he could not spare any priests to manage the project, he appealed for help from the Congregation of the Sacred Hearts of Jesus and Mary (SS.CC. ), a Catholic order whose priests were already active in Indonesia. He asked the Provincial of the Dutch Province if he could spare two priests to build the church and to take care of the parish in Queenstown. In 1958, Father William van Soest and Father Odo Tiggeloven, two priests from the SS.CC. of Holland, arrived in Singapore. The former was assigned to build the church and be its parish priest with the assistance of the latter. It was anticipated that the church would cost up to S$200,000 to build. However, the two priests had difficulty in raising funds, as there were only a few hundred Catholics in Queenstown by 1960. Efforts to raise funds for the new church included the staging of a variety show at the National Theatre, a movie screening at the Globe Theatre, and a food and fun fair. Circus Malaya and the Tai Thean Kew Circus also donated proceeds from their performances to the church building fund. Due to limited funds, the church was built in stages. In October 1963, the first building, Damien Hall, was completed. It was named after Saint Damien of Molokai, a priest from the SS.CC. who had dedicated his life to caring for those afflicted with leprosy in Molokai, Hawaii and who had fallen victim to the disease. After a simple ceremony by Monsignor Noel Goh on 17 November 1963, Damien Hall was opened to the public as a place of worship. It also provided lodging to the two priests who, up till then, had been staying at the Cathedral of the Good Shepherd and at St Patrick’s School. The church was finally completed and officially opened and blessed by Archbishop Olcomendy on 8 May 1965. It was named the Church of the Blessed Sacrament, as the priests of the Sacred Heart order were devoted to the Blessed Sacrament. The church was designed by Y. Gordon Dowsett of the architecture firm Van Sitteren and Partners. Its most outstanding feature is its blue slate roof, which is constructed in folds in the shape of a tent. The roof is said to symbolise the “tent of meeting” in the Old Testament of the Bible, and covers the main sanctuary, which is built in a cruciform shape. The roof is also designed with integrated glass panels where the four sections of the cruciform shape meet to allow natural light into the sanctuary. The worship hall is made of fair-faced brick walls with timber ceiling panels. There is also a Celtic cross, which combines a circle with a cross, on the exterior brick face wall of the main altar. The church’s distinctive design, coupled with its prominent location along Commonwealth Drive, makes it a landmark, and it was given conservation status by the Urban Redevelopment Authority on 25 November 2005. Due to financial constraints, the church was built to cater to 2,000 parishioners although it was expected to grow to 6,000 as the town developed. In the 1970s, the number of parishioners reached 6,000 as predicted and in the 1980s, it ballooned to 7,000. By then, there was a demand for additional space for catechism classes and meeting rooms where smaller groups of people could meet and get to know one another. After an appeal for funds, Damien Centre was built and opened on 30 May 1982. In 2005, the Sacred Heart priests rebuilt Damien Hall to cater to the needs of the growing number of organisations within the church and to meet the Ministry of Education’s request for smaller kindergarten classes. The new Fr Damien Centre was officially opened on 22 September 2007 by Monsignor Eugene Vaz. The church currently serves around 4,300 parishioners. The decline in numbers compared to the 1980s reflects the changing demographics of the mature Queenstown neighbourhood, where older apartment blocks have been vacated for redevelopment and young families are opting for newer residential towns. However, the church continues to be a vibrant community with about 11 organisations including the Catholic Neighbourhood Groups and Outreach Ministry, as well as activities such as novenas and intercessory prayers.